The Assyrians were pagans, so they worshipped many gods. They kept records of the gods in their life. Click the button below to go to Record Keeping and Writing to see how they recorded their religion. Ashur was worshipped mainly by the upper half of Mesopotamia. Ashur is the national god of Assyria. 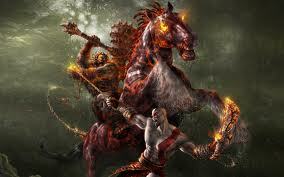 He is the god of war, and is symbolized by a dragon and winged disk. Ishtar, otherwise known as Ishhara, Iriniri or Inanna, was the most important goddess and the wife of Ashur. She is the goddess of love, protection and war. Nergal also known as Erragal, Erra and Engidudu is the god of war and plague. 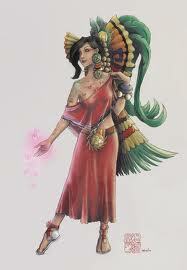 Aruru is the mother goddess and midwife of the gods. Gushkin also known as Banda is the creator of god and man. He is also the goldsmith god. Nin-ildu is the carpender god. Mummu is the craftsmen god. Adad, the god of thunder, fire and rain. He is also known as Hadad, Hanish is his servant. Shala is his wife, 'the lady of the ear of corn'. Sin also known as Nannar, is the moon goddess and Shamash, also known as Babbar, the sun god. Aia is Shamesh's consort, and Shullut is his servant. Ningal is the consult to Sin. Nash is a pure goddess. The purest goddess in all the hevans. Goddess of all things pure. Mammetun is the maker, or mother, of fate. The fate goddess. Nammu is the goddess of water. Enemesharra is the head god of the underworld. Isum is the goddess of fire. There were many more gods and goddesses, but these were the major gods and goddesses worshipped by the Assyrians .